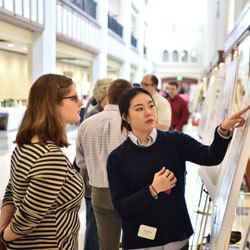 The College of Science and the College of Engineering Joint Annual Meeting (COSE-JAM) for graduate students and postdoctoral fellows will take place in Jordan Hall of Science on Friday, Dec. 8. The event will highlight the achievements of graduate and postdoctoral researchers, foster interdisciplinary collaborations, and provide career mentoring. This first-ever joint meeting is an exciting opportunity to showcase diverse, cutting-edge research by our trainees. It also provides an excellent opportunity for graduate students and postdoctoral fellows throughout Notre Dame to avail themselves of the career services and grants resources provided by the Graduate School as well as experience a seminar on entrepreneurship by the leadership of the IDEA Center. The schedule and list of abstracts and presentations can be found below. Please address any questions to Professor Matt Ravosa.